Cradled in the twin mountain ranges of Nar and Narayan is the holiest of the four main shrines, Badrinath along the right bank of river Alaknanda. With the splendid Neelkanth mountains as the backdrop, it is important destination on the sacred itinerary of every devout Hindu. Once the spot was carpeted with badri or wild berries and hence was famous as Badri Van. The eastern most shrine of Badrinath is the last and final stopover for Char Dham pilgrimage. The revered shrine is still alive with myriad legends from mythology. Its sanctity is emphasised in the ancient scripture as There are many sacred spots of piligrimage in the heavens and earth, but there has been none equal to Badri, nor shall there be. Legend has it, when the Ganges was requested to descend to the earth to help the suffering humanity, the earth was unable to withstand the force of its descent. Therefore, the mighty Ganga split into twelve holy channels. Alaknanda was one of them that later became the abode of Lord Vishnu or Badrinath. The temple of Shri Badrinathji on the bank of the Alaknanda river, dates back to the vedic times. Situated at the altitude of 3,133 mts., the present temple is believed to have been build by Adi Guru Shankaracharya - an 8th century's philopsopher-saint, who also established a Math here. Also known as Vishal Badri. 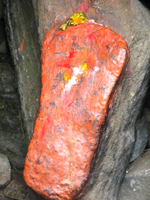 Badrinath is one of the Panch Badris. On the right bank of Alaknanda lies the sacred spot perched at the altitude of 3,133 mts. above the sea level. Encircled by a beautyful valley, the 15 mts. high temple is dedicated to Lord Vishnu. It is build in the form of a cone with a small cupola of agilt bull and spire. built by Adi Guru Shankaracharya - the philosopher-saint of the 8th century, the temple has been renovated several times due to damage by avalanches. It's colorful Singh Dwara or main entrance gate gives it a modern look. The temple is divided into three parts the garbha griha or sanctum sanctorum, the darshan mandap where devotee aassemble. 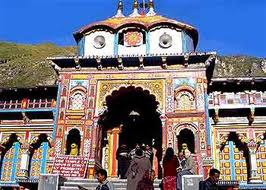 The complex has 15 idols especially attractive is the one metre high image of Badrinath, finely sculpted in black stone. It represents Lord Vishnu in a mediative pose. Devotees take a holy dip in the natural thermal springs on the banks of river Alaknanda, before entering the Badrinath Temple. 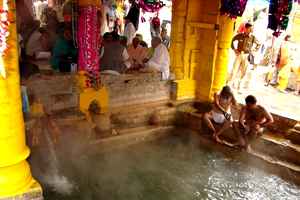 The water of the kund is believed to have medicinal properties. A pyramidical-shape snowy peak towering above the Badrinath, popularly known as the Garhwal Queen. The footprints of Lord Vishnu can be seen on the boulder in this beautiful meadow. A flat platform on the bank of river Alaknanda where Hindu perform propitiating rites for their deceased ancestors. Valley of Flowers is God's own country. Hidden from the outside world, known only to some hight land inhabitants of Bhyunder Valley, it was avidly avoided by the shepherds of the hills, believing it to be the celestial playground of the gods, nymphs and faries. An exotic valley in a conical shape lies to the east of Badrinath with river Pushpawati flowing through it. The valley that is presently a national park is 19 kms trek from Govind Ghat. A must see for all natural lovers. The source of Alaknanda river from the glacier snouts of Bhagirath-Kharak and Satopanth glacier. A three cornered lake with a circumference of about 1 km., is situated at an elevation of 4,402 mts. above the sea level. It is named after the Hindu triad - Brahma, Vishnu and Mahesh, who are believed to occupy one corner each of the lake. The trek is hazardous with dramatic landscapes. An experienced guide is advised. Jolly Grant, Dehradun 317 kms.